An Indiana native, Jared is a new addition to the Fifth Third team and brings with him over seven years of lending and commercial banking experience. Jared is energetic, innovative, and inquisitive. He has a passion for truly understanding business operations in order to optimize financial productivity and return for his clients and customers. In his years of banking experience, Jared has gained an in depth industry understanding in the areas of manufacturing, professional services, e-commerce and commercial real estate. Hailing from Evansville Indiana, Jared is a graduate of the University of Southern Indiana College of Business where he earned his bachelor’s degree in business administration. He is also a member of the Indiana Bankers Association and is certified by the IBA in commercial lending and risk analysis. Jared has been recognized as the top 20 under 40 young professionals by the Evansville Business Journal and the News4U Magazine in Indiana. 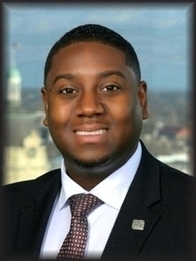 He is very involved in the community volunteering for over 10 non-profit boards in the city of Evansville and also serves as president of the Evansville Commercial Loan Administration Board. When not volunteering his time for local organizations, Jared likes to spend time with his wife.